Etiology of liver disease is often established on serology, metabolic profile, or less commonly genetic testing in conjunction with sound structural imaging. Staging of liver disease, however, is more complex and noninvasive methods such as transient elastography, shear wave elastography, or specialized magnetic resonance imaging can be helpful in this regard. However, the ultimate gold standard is a liver biopsy (LB) for both diagnosis (especially in seronegative disease) and staging of both acute and chronic liver disease. This can be performed via the percutaneous, transjugular, or surgical approach. EUS-guided LB (EUS-LB) is a promising new technique with some advantages over the traditional methods. This chapter will cover the merits of EUS-LB including technique, needle types, safety, and diagnostic yield. The patient is positioned in the typical left lateral position under moderate sedation. A linear echoendoscope is used to study the liver parenchyma with Doppler imaging. Avoidance of ductal structures is of paramount importance, and a 19G needle is used to procure liver cores via a transgastric and/or transduodenal approach to target the left or right lobe of liver [Figure 1]a. The optimal technique is yet to be established hence techniques vary among expert centers. This could range from a single pass to multiple passes, a variable number of to-and-fro needle movements and degree of suction is at the discretion of the proceduralist. Tissue acquisition technique has been evaluated recently in cadaveric tissue  found no difference between the degree of suction ranging from slow pull (capillary pressure) to 30 ml syringe suction. In general, however, higher suction (20 ml) with larger needles tend to generate greater negative pressures at the needle tip. Priming the needle with a column of fluid may increase the volume of tissue acquisition  as demonstrated in a three-dimensional computational fluid dynamic model. Finally, cessation of Doppler signals [Figure 1]b within the needle tracts should be observed before needle withdrawal from the Glisson's capsule to theoretically reduce the risk of subcapsular hematoma. Our current technique includes high suction (20 ml) with a 19G needle primed with heparin-saline to decrease clotting of blood within the needle lumen. Four-needle types have been used for EUS-LB in the clinical setting. The tru-cut biopsy (TCB) needle [Figure 2]a was first used for EUS-LB in 2007 on two patients demonstrating feasibility. Two further studies were then conducted by Gleeson and Levy  and Dewitt et al. yielding somewhat suboptimal specimens but without adverse events. Subsequently, three studies used the straight standard needles [SSN, [Figure 2]b,, with better results [Table 1]. A study utilizing the core histology needle [CHN, [Figure 2]c with a built-in reverse bevel followed and a comparison between TCB and CHN revealed the CHN to be superior to the TCB needle. The only study to involve SSN and CHN  showed the SSN procured almost double the number of CPT compared to the CHN (19.4 vs. 9.8). Most recently, a new shark core needle [SC, [Figure 2]d had been shown in a cadaveric study  to be superior to all preceding needle types; even better than the 18G percutaneous LB needles. Clinical studies were subsequently carried out on 165 patients with excellent yield [Table 1]; although, this was not a comparative study. Following withdrawn of the FNA needle from the linear echoendoscope, the liver cores are expressed from the FNA needle. This is the best accomplished by gentle, steady flushing of saline from the needle handle. If, however, the specimen does not deliver with saline flush, the stylet can be used to advance the specimen, followed again by saline flush. At this point, it is ideal to separate the liver cores from the blood clots carefully as these cores are extremely fragile. Blood should be removed as this is likely to hinder histological preparation and assessment. The cores can either be placed directly into a formalin bottle or placed on filter paper then enclosed by a cassette and submitted in formalin [Video 1]. The key advantage of EUS-LB is in obese patients with liver disease (e.g., suspected nonalcoholic steatohepatitis-NASH). This patient cohort may pose technical difficulties to the percutaneous or transjugular methodologies due to subcutaneous adiposity. There will also be an increasing need for LB in patients with NASH because these patients are at risk of progression to advanced fibrosis.,, EUS-LB in a morbidly obese patient would not pose any additional technical challenges to the endoscopist, as internally, there is little anatomical variability with views obtained at EUS regardless of body weight. TLB actually carries a 3.2% chance of procedural failure largely due to venous cannulation difficulties. There had been no reports of technical failures related to EUS-LB to date. The conventional algorithm for higher risk patients (obese, coagulopathic, and thrombocytopenic) are often deferred for TLB which carries a complication rate of up to 7.5%;,, however, major complication rate between 0.5% and 1.8%,,, which is very similar to image-guided PLB. The collective patients who had undergone EUS-LB are 470 [Table 1], with only two reports of major complication (both involved bleeding managed conservatively). This early data would suggest EUS-LB is relatively safe; however, certainly larger studies are necessary. Patients who have had both the percutaneous and EUS-LB preferred the EUS-LB  and were happy to have it again if necessary. Reports of EUS-LB-related pain are rare;,,, therefore, the recovery protocol is no different to that of a diagnostic endoscopy which translates into improved flow efficiency compared to PLB patients who would have to lie on their right side for a several hours to reduce risk of bleeding (and pain) as studies have shown 20% of PLB patients experience severe pain post-PLB, 35% requiring analgesia  and 39% had ongoing pain at 24 h post-PLB. The EUS-LB technique is capable of a high diagnostic yield [Table 1]. The diagnostic yield is between 90% and 100%. Objective assessment of histologic yield revealed that studies using non (TCB) needles have produced a mean CPT yield of at least 9 CPTs from 2 to 3 passes (median) which is more than adequate by conventional standards. Although the staging of viral hepatitis may require a higher quality specimen, the need for liver biopsies in the management of viral hepatitis has declined significantly. EUS-LB would be particularly well suited for diseases with patchy distribution  (e.g., Fatty liver disease) as multiple to and fro movements can sample liver parenchyma more widely as well as sampling both left and right lobes if required. There has been no significant difference in yield (CPTs) when targeting left or right lobe of the liver via the traditional percutaneous  or the new EUS  method. 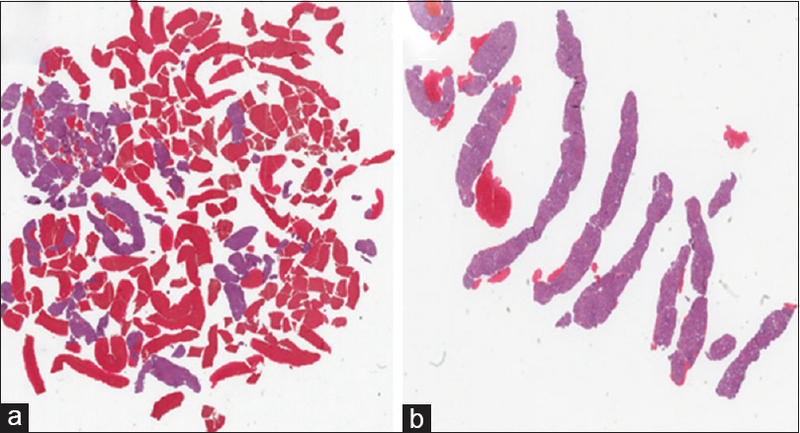 EUS-LB is capable of obtaining very impressive length of specimen; however, there is a tendency toward excessive fragmentation which may hinder histological interpretation [Figure 3]a. Hence, emphasis on total length of specimen probably is of less importance as opposed to length of the longest intact core [Figure 3]b. The endoscopic approach facilitates concurrent assessment for the presence or complications of portal hypertension by conventional and novel means. A conventional endoscopic mucosal assessment for evidence of portal hypertension can be carried out (e.g. gastroscopy to look for varices and portal hypertensive gastropathy) before EUS-LB and the novel method of measuring portal pressure gradient can be performed simultaneously. These two additional examinations can certainly be invaluable adjuncts to the liver histology in the staging of chronic liver disease. The inherent advantages of the endosonographic approach to LB are clear. From the patient's perspective, it appears safe and largely painless. From a technical standpoint, it allows for sampling of a wider area of the liver and is not hindered by morbid obesity, therefore, highly successful in these patients. Finally, diagnostic yield is now well beyond conventional standards and further bolstered by information gathered from same session mucosal inspection for signs of portal hypertension and direct measurement of the portal pressure gradient. With ongoing refinement in needle type and suction techniques, further improvements in sample quality are only a matter of time. For some, adoption of this technique may be simply a mental barrier, as conventionally, liver biopsies have come from larger 16 or 18G needles, which may no longer be necessary. Schulman AR, Thompson CC, Odze R, et al. Optimizing EUS-guided liver biopsy sampling: Comprehensive assessment of needle types and tissue acquisition techniques. Gastrointest Endosc 2017;85:419-26. Katanuma A, Itoi T, Baron TH, et al. Bench-top testing of suction forces generated through endoscopic ultrasound-guided aspiration needles. J Hepatobiliary Pancreat Sci 2015;22:379-85. Berzosa M, Uthamaraj S, Dragomir-Daescu D, et al. EUS-FNA wet vs. dry suction techniques; a proof of concept study on how a column of water enhances tissue aspiration. Gastrointest Endosc 2014;79:AB421-2. Mathew A. EUS-guided routine liver biopsy in selected patients. Am J Gastroenterol 2007;102:2354-5. Gleeson FC, Levy MJ. EUS trucut biopsy liver parenchyma acquisition and yield are comparable to that of a transjugular liver biopsy. Gastrointest Endosc 2009;70:1046. Dewitt J, McGreevy K, Cummings O, et al. Initial experience with EUS-guided tru-cut biopsy of benign liver disease. Gastrointest Endosc 2009;69:535-42. Stavropoulos SN, Im GY, Jlayer Z, et al. High yield of same-session EUS-guided liver biopsy by 19-gauge FNA needle in patients undergoing EUS to exclude biliary obstruction. Gastrointest Endosc 2012;75:310-8. Gor N, Salem SB, Jakate S, et al. Histological adequacy of EUS-guided liver biopsy when using a 19-gauge non-tru-cut FNA needle. Gastrointest Endosc 2014;79:170-2. Diehl DL, Johal AS, Khara HS, et al. Endoscopic ultrasound-guided liver biopsy: A multicenter experience. Endosc Int Open 2015;3:E210-5. Nieto J, Khaleel H, Challita Y, et al. EUS-guided fine-needle core liver biopsy sampling using a novel 19-gauge needle with modified 1-pass, 1 actuation wet suction technique. Gastrointest Endosc 2018;87:469-75. Sey MS, Al-Haddad M, Imperiale TF, et al. EUS-guided liver biopsy for parenchymal disease: A comparison of diagnostic yield between two core biopsy needles. Gastrointest Endosc 2016;83:347-52. Nakanishi Y, Mneimneh WS, Sey M, et al. One hundred thirteen consecutive transgastric liver biopsies for hepatic parenchymal diseases: A single-institution study. Am J Surg Pathol 2015;39:968-76. Lee WJ, Uradomo LT, Zhang Y, et al. Comparison of the diagnostic yield of EUS needles for liver biopsy: Ex vivo study. Diagn Ther Endosc 2017;2017:1497831. McPherson S, Hardy T, Henderson E, et al. Evidence of NAFLD progression from steatosis to fibrosing-steatohepatitis using paired biopsies: Implications for prognosis and clinical management. J Hepatol 2015;62:1148-55. Adams LA, Lymp JF, St Sauver J, et al. The natural history of nonalcoholic fatty liver disease: A population-based cohort study. Gastroenterology 2005;129:113-21. Sanyal AJ, Banas C, Sargeant C, et al. Similarities and differences in outcomes of cirrhosis due to nonalcoholic steatohepatitis and hepatitis C. Hepatology 2006;43:682-9. Soyer P, Fargeaudou Y, Boudiaf M, et al. Transjugular liver biopsy using ultrasonographic guidance for jugular vein puncture and an automated device for hepatic tissue sampling: A retrospective analysis of 200 consecutive cases. Abdom Imaging 2008;33:627-32. Kalambokis G, Manousou P, Vibhakorn S, et al. Transjugular liver biopsy – Indications, adequacy, quality of specimens, and complications – A systematic review. J Hepatol 2007;47:284-94. Kis B, Pamarthi V, Fan CM, et al. Safety and utility of transjugular liver biopsy in hematopoietic stem cell transplant recipients. J Vasc Interv Radiol 2013;24:85-9. Boyum JH, Atwell TD, Schmit GD, et al. Incidence and risk factors for adverse events related to image-guided liver biopsy. Mayo Clin Proc 2016;91:329-35. Castéra L, Nègre I, Samii K, et al. Pain experienced during percutaneous liver biopsy. Hepatology 1999;30:1529-30. Fernández-Salazar L, Velayos B, Aller R, et al. Percutaneous liver biopsy: Patients' point of view. Scand J Gastroenterol 2011;46:727-31. Eisenberg E, Konopniki M, Veitsman E, et al. Prevalence and characteristics of pain induced by percutaneous liver biopsy. Anesth Analg 2003;96:1392-6. Bravo AA, Sheth SG, Chopra S. Liver biopsy. N Engl J Med 2001;344:495-500. Colloredo G, Guido M, Sonzogni A, et al. Impact of liver biopsy size on histological evaluation of chronic viral hepatitis: The smaller the sample, the milder the disease. J Hepatol 2003;39:239-44. Ratziu V, Charlotte F, Heurtier A, et al. Sampling variability of liver biopsy in nonalcoholic fatty liver disease. Gastroenterology 2005;128:1898-906. Intraobserver and interobserver variations in liver biopsy interpretation in patients with chronic hepatitis C. The French METAVIR Cooperative Study Group. Hepatology 1994;20:15-20.